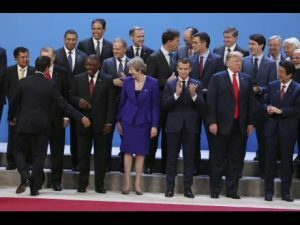 World leaders have a laugh as they gather for a group photo at the start of the G20 summit in Buenos Aires, Argentina, last Friday. From right, front row, are Japan’s Prime Minister Shinzo Abe, US President Donald Trump, France’s President Emmanuel Macron, Britain’s Prime Minister Theresa May, South Africa’s President Cyril Ramaphosa, Turkey’s President Recep Tayyip Erdogan and Indonesia’s Vice president Jusuf Kalla. Behind, from left, are Jamaica’s Prime Minister Andrew Holness, European Council’s President Donald Tusk, the Netherlands’ Prime Minister Mark Rutte, Spain’s Prime Minister Pedro Sanchez, Canada’s Prime Minister Justin Trudeau, International Monetary Fund Managing Director Christine Lagarde and India’s Prime Minister Narendra Modi. Prime Minister Andrew Holness has underscored the need for more action and less talk on climate change, which continues to pose a serious threat to small island states. Addressing a G20 meeting in Buenos Aires, Argentina, yesterday, Holness declared that it is time to move from “climate talk to climate action”. Holness added: “The small island states of the Caribbean, whose case I plead at this summit, do not have the luxury of engaging in a philosophical debate on climate change. 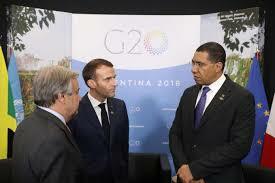 Holness, who recently accepted an invitation to co-chair an initiative on climate financing with the President of France Emmanuel Macron, nudged the G20 leaders to meet the long-standing commitment to mobilise the agreed US$100 billion per annum by 2020 to address climate change. “While the international community works towards a consensus on the approach to the existential global threat of climate change, vulnerable states must act on their own behalf to adapt and build their own resilience. “We have a duty to be fiscally responsible, energy smart, and embracive of technology and innovation in this regard,” added Holness, as he pointed out that Jamaica has embraced fiscal responsibility and energy diversity with the help of development partners. “However, despite our efforts and ownership of the problem, these gains could be easily reversed with the direct hit of a single hurricane. “It is for that reason that Jamaica has a simple, principle-oriented proposition: countries which demonstrate fiscal credibility, and develop a track record of fiscal responsibility, but yet remain vulnerable to the fiscal impact of natural disasters, should be eligible for international cooperation and assistance in the acquisition of ex ante financial insulation for the cost of emergency response to natural disaster,” said Holness.